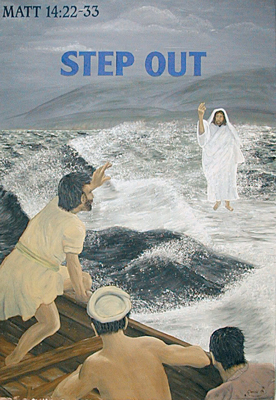 The painting was commissioned by this year’s president of The Churches of Christ (who is also a member of Happy Valley Church) to illustrate this year’s theme – ‘Step out of the boat’. The walk on the water happened very early on a stormy morning (Matthew 14:22–33) so I pictured the scene as grey early morning light. It is a very challenging message, particularly here at Happy Valley where we are considering some major changes which will certainly require many of us to ‘step out’ of our comfortable boat.